The Sacrament of Holy Baptism is the entrance into the Christian life. Anyone who desires to receive the gift of baptism may obtain it at Dove of Peace. In addition, our congregation will administer baptism to infants and young children with the consent and presence of their adult family members. Baptism makes a person part of the whole Church. Someone may be baptized in a Lutheran church, but baptism does not make them a “Lutheran.” Baptism makes them a Christian. If you were baptized in another Christian community or denomination (Presbyterian, Roman Catholic, Baptist, Episcopalian, etc.) your Christian baptism is affirmed at Dove of Peace. We do not re-baptize anyone a second time. Holy Baptism is normally performed by an ordained member of the clergy (our pastor) and takes place in the context of public worship, such as our regular Sunday services. a commitment to the life and mission of God’s Church. 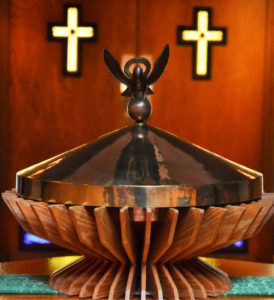 Baptism automatically makes a person a member of Dove of Peace Lutheran Church, until that person requests that their membership be transferred to any other Christian congregation. Please contact our pastor to learn more.